Hi Kalkidan! How would you sum up the essence of your business, Sancho’s? 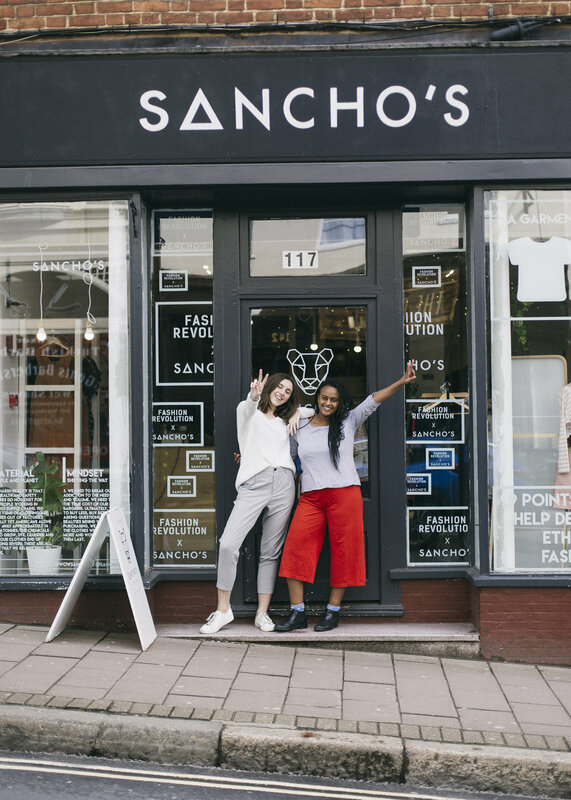 Sancho's main shop is a beautiful little space in the best part of town, where you can discover some fantastic ethical brands, and also learn about how sustainable fashion works. 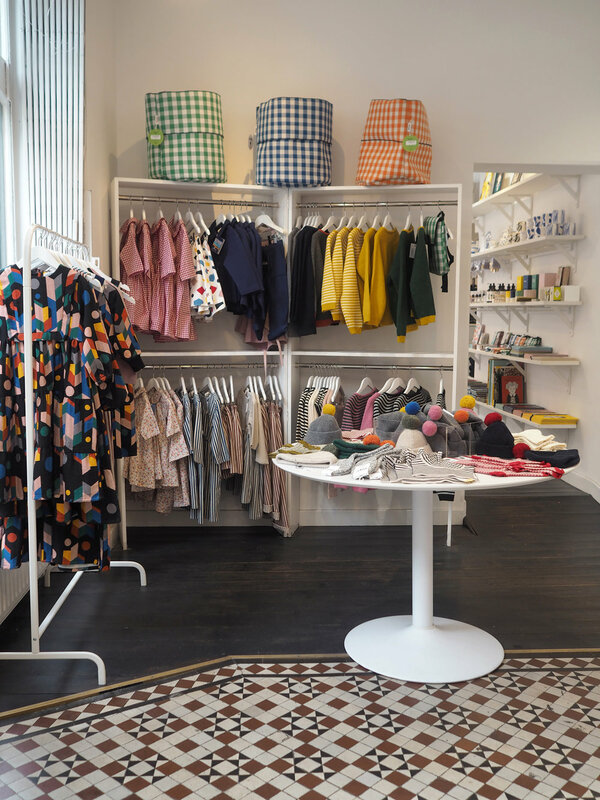 The staff are brilliantly friendly, dogs are welcome and the clothes are all made with natural environmentally sound fabrics in fair trade conditions. What inspired the idea of setting up Sancho’s, and what was your journey in making it a reality? Our first objective with Sancho's was to celebrate crafts from fair trade producer groups in Ethiopia. I had actually not really known how clothing was made until I first saw weaving in Ethiopia during a work placement. It blew my mind, like seeing a new colour. I suddenly got a sense for how the clothing, that usually is only associated with style and trend, comes from the hard work of individuals, and I fell in love. Weaving is like that - weavers create fabrics and clothes from things as simple as cotton spools. I thought that was amazing then, and I still do! As an Ethiopian I was also really proud to see this new culture, art and story from my home. A story so different to what I grew up learning about Ethiopia - centred on poverty and Bob Geldof. I wanted to share that with the world. The idea developed because we learnt that we were not the only ones who didn’t really understand how clothing was made - and actually our ignorance was not by accident but by design. The industry is focused around selling customers new clothes - and presenting the idea that we all need to keep up with fast changing trends - whilst encouraging us to seek the lowest possible price. This of course comes at the cost of the makers in developing countries around the world. We wanted to change that, connecting people with makers and providing a shop for brands, makers and designers actually doing the process right, and transparently. 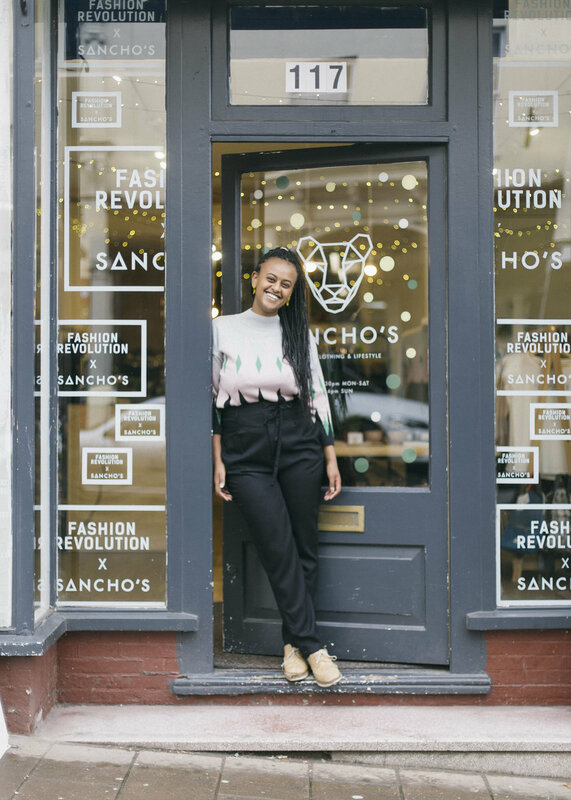 That’s how Sancho's became the ethical clothing and lifestyle shop that it is today. What are co-founder Vidmantas and your backgrounds? We were both students studying various forms of sustainable economics. I’m an Ethiopian immigrant, he is a Lithuanian immigrant, and we met during the summer working as part-time waiters at the university. We both had to work as students (I actually started working at 14, as a paintball marshall), and gained a range of experience, from part-time teaching to working for non-governmental and non-profit organisations. We first started Sancho's at university, and opened a pop-up about one month after graduating. Where does the name Sancho’s come from? Sancho is a nickname used to describe girls who are strong and a little chubby in Ethiopia. It’s a household name that I picked up from childhood, having always been strong and a little chubby. As my name is unusual for the UK (although very common in other parts of the world), I have picked up various nicknames over the years, but Sancho has always stood out as my favourite! What are the values that underpin your business? We set out to create as much positive impact as we can through fashion. So our clothing is made with natural and sustainable materials, under fair trade conditions. We ensure that we source from suppliers that have these principles by looking for audits and certificates, like those provided by the Global Organic Textile Standard and the World Fair Trade Organisation. We have a range of small scale, locally-made items which are not certified - however in these cases we deal with the makers directly and always follow prices set by them. We have also built a repairing service into our business, so that we can alter clothing for other people and repair small damages - this allows us to put no clothing into landfill at all as a business, and as a result we are quite pleased! Being ethical and sustainable is a journey, and we try to ensure that we are always moving in the right direction by reviewing our purchasing decisions regularly and applying new information as we learn it. How did you first discover your love for what you do, and realise the direction you wanted to take? I'm not sure that I see Sancho's as one direction. I, like most other people, am discovering myself and my goals for my life. Sancho's currently is the gift in which my partner and I get to live our values and make our impact on the world. I love it because it is so freeing in direction, and takes me multiple places. Every now and again, I try to sit down with myself to make sure that I am living my values, and that Sancho's is healthy and moving forward - then I try to align these two things. What inspires you creatively in what you do at Sancho’s? I’m very much motivated by trying to live out the words 'be the change you want to see in the world'. A lot of our decisions come from asking ourselves what is the best we can do with the business as our tool. For example, over the past year or so, the real cost of single waste plastic use on the environment is becoming clearer. We've been learning alongside our customers that we have to change our habits. As a result, we did some research and found that people find it quite challenging to source alternatives to single plastic products - things as simple as wooden tooth brushes or traditional steel razors. There are a whole host of products that people might not even consider to replace, such as sanitary products (the average women uses over 1000 tampons in her adult life!). After we had done this research, we knew we wanted to at least provide a small alternative, which is why we launched our zero waste range. Most of our decisions happen organically like that, and because we hope that they will do a little good. Is the online community integral to your work? Most of our communication happens on social media and it is a hugely useful tool for building a community and staying in touch with them. We spend quite a lot of time on our Instagram, and love using it. Do you have any creative pastimes and passions? I wish I could say that I had many other pastimes, but I spend most of my time working on Sancho's. Happily so, currently. I am also a keen (amateur) runner, and feel really lucky to be so close to the green spaces near Exeter. If I want to unwind, I will paint - currently privately but one day this is a skill I'd like to hone in on. How did you go about designing Sancho’s spaces? We want our stores to feel inviting and inclusive, like the home of a radical and loving aunty who has great sense of fashion! We did this by mixing in slogans - our affirmations - with natural materials, bright spaces and of course, beautiful clothes. We hope that people find the shop easy and welcoming. How do you source and curate pieces for Sancho’s? We source our stock a few different ways, from going to shows, to scrolling through Instagram, and also sometimes travelling out to areas where makers excite me. A range of things really, and this constantly evolves depending on what is being made where, and my budget for trips! 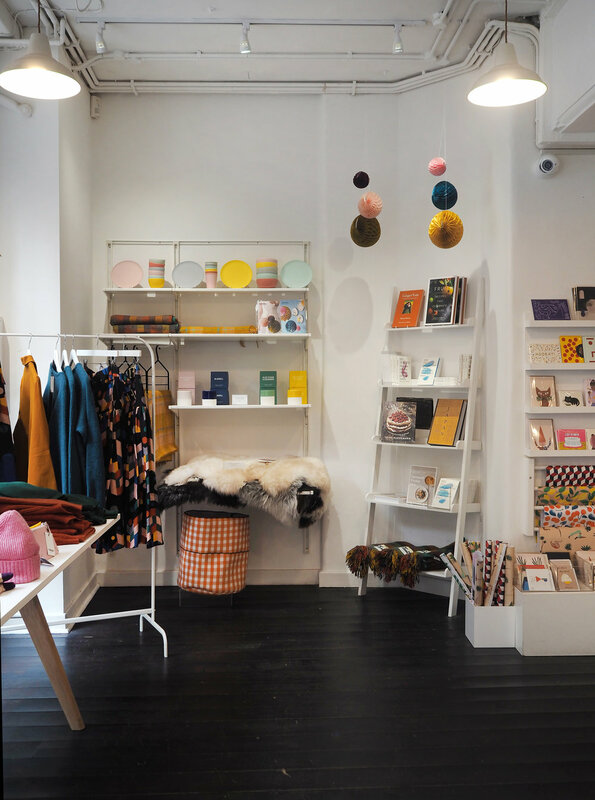 What are the joys, and the challenges, of working as an independent retailer? I love the freedom there is in making so many decisions on the basis of personal goals, taste and values. Whether that is as simple as the music to play that day, or as complex as launching a collection. But of course, the freedom also comes with responsibilities, and sometimes I wish that there was someone to tell me what to do (although whenever anyone does, I am immediately reminded as to why being independent is hugely important to me personally). I would be lying if I said that it was not financially challenging, or that it did not require long hours - because of course it is and it does. But when I am worried about finances, I try to remember that there are people in this world that have always had so much that they've never had to worry, and I’m reminded that my worry is a reality that I can navigate through. And recently, I've learnt to rest when the hours become too long - so these challenges, like others, are manageable. Opening our second store was a huge triumph - I believe this is when it felt like we actually had a business for the first time - I am not sure why. How does your typical working day look? I usually get up around 7.30am, then check emails and Instagram, shower, drink coffee, and sometimes I’ll go for a short run. Then during an average day - I review plans for the day, send out tasks for the team, head to the shop, check online orders and deliveries, respond to emails, speak with our lovely customers, find out how our designs are progressing, read about sustainability, project objectives for the next day/week/year and write a plan, have a meeting with a client, supplier or colleague, serve customers, answer phone calls, hop on Instagram again, tell a joke, do a little dance, get super hungry, head home, edit the website, watch Vidmantas cook dinner, eat loads, have a shallow bath or hot shower, watch some Netflix, text my mum, and finally - sleep! How do you find juggling an online business with a physical shop? It’s very natural to me, given that we live in a digital era, to have a presence both in store and online. Which are your bestsellers or favourite products? We are super excited about our Foundation collection, which is being made here in Devon! The shapes are so flattering and the colours are really rich, so they have proven to be popular with our customers. We are also in love with the minimalist range of jewellery from Clare Elizabeth - the styles are so chic and made so well, they always make a huge impact. We simply try to get as informed as we can, and then follow up leads that excite us. Any tips to share with aspiring independent store owners? I think the best things that anyone looking to start their own store or business can do is learn how to trust their gut, learn how to take good advice (wherever it comes from) and learn how to ignore fear and self-doubt long enough to get started. What’s up next for you and Sancho’s? We are exploring design and producing our own collections! Our goal is to bridge the gap in sustainable basics between affordability and style. The collections will all be made in the UK and will be an inclusive fit in size. Find Sancho’s at 117 Fore Street (womenswear) and 126 Fore Street (menswear), Exeter and online. We love Instagram, we really do, but with increasing frustration at the algorithm we all battle with on a daily basis, it feels like many are looking for alternative ways to market their small business effectively. At our recent Seek Inspire Create event in Lewes, Georgie and Dorte of Social Pow Wow gave a talk to our group about how to use Pinterest for business. It was a total eye-opener. I have also recently taken their e-course and have found by taking their advice, I am seeing more traffic to our website and our monthly unique viewers on Pinterest have more than doubled in the space of a few weeks! I therefore decided to invite Dorte and Georgie to share their top five Pinterest tips with our blog readers so that you can try implementing their advice yourselves, hopefully driving more traffic to your online space, too. Over to you ladies! The first thing to understand is that Pinterest is different from other online marketing platforms like Instagram and Facebook. Users are actively searching for something - content, information, services and products. They aren’t just scrolling; looking to see what others are doing, commenting and liking. Pinterest users have specific interests and are shown content related to their interests. This means that what they are seeing when scrolling through Pinterest is likely to be the kind of thing they would click on to find out more about. The question is, how can you make sure they click on your pins and discover your business and your products or service? Here are 5 ways to make Pinterest work harder for your creative business that you can easily implement into your Pinterest strategy and see results quicker than you’d think! Pinterest is a positive place that people escape to for aspiration as well as practical ideas that they can act on in their daily lives. It helps to keep this in mind when creating your pin, as well as making it attractive and useful, show how it will fit into people’s lives. Pinners want to save pins that inspire, engage and tell a story! Stand out in the Smart Feed and catch the eye. Entice people to click through to your website. Pinterest is a SEARCH ENGINE. What would your perfect customer search for to find your Pin? Figure out what your keywords are. Write complete sentences using the keywords that describe your product or service in the Pin. A third of all Google searches are for images! Pinterest is popular because people are drawn to visuals and love searching for them. By not deleting that ‘IMG_1785’ title and including keywords in your Alt Text then you’re missing a huge SEO trick and ruining your chances of appearing in search. Pinterest rewards pins that are saved consistently. It doesn’t work if you save 100 pins in one day and then none for a week. It is much more effective to drip feed these pins to your boards over the week. The best way to do this is to use a scheduling tool. An authorised Pinterest partner, Tailwind is easy to use and is a great timesaving tool. (Sign up for your free trial here*) Using Tailwind means you don't have to manually pin every day. You can even have all your pins scheduled for two weeks in advance while you’re on holiday! No commenting or engagement required to get results either! *This an affiliate link. Which means if you start to pay the monthly fee, (only $9.99 per month and worth every penny) Social Pow Wow will receive a small fee. Social Pow Wow recommends Tailwind because they use it and it works! They want you to get results for your business too. Think of your Pinterest account as a lifestyle magazine for your business. Include great content from others that compliments your business ethos. This will help you to hone down your aesthetic and style and see you become a resource. There is no magic ratio of your pins to others and it depends on how much of your own content you have. Experiment! To learn more about how Pinterest can help your creative business to thrive and flourish visit Social Pow Wow for a one-stop shop on all things Pinterest! Podcasts, free downloads, blogposts and the online course mentioned in the introduction. In our ethical living series we have looked at beauty, laundry, gifts and fashion and now we are looking to interiors. How can we style our homes beautifully while minimising our impact on the environment? 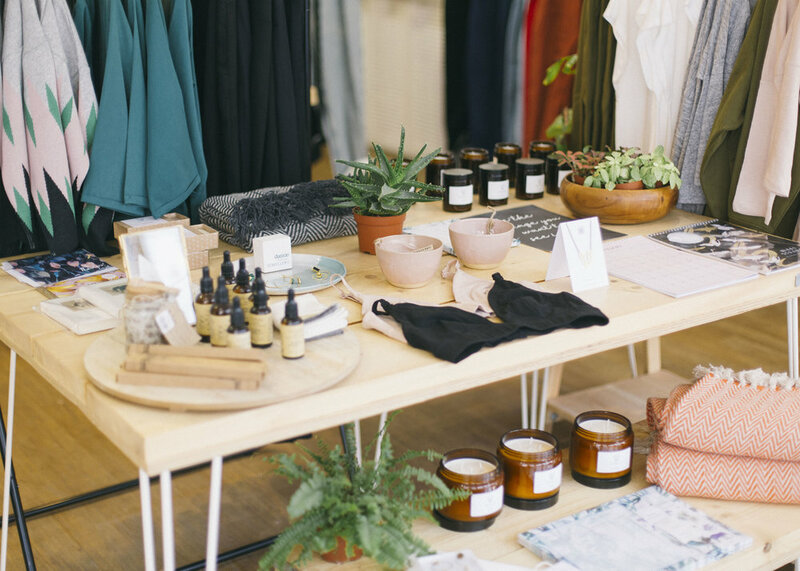 Stylists and business owners Karen Barlow and Kirsty Saxon investigate this and gather a collection of homewares and accessories that tick all the right boxes in terms of their ethical credentials. 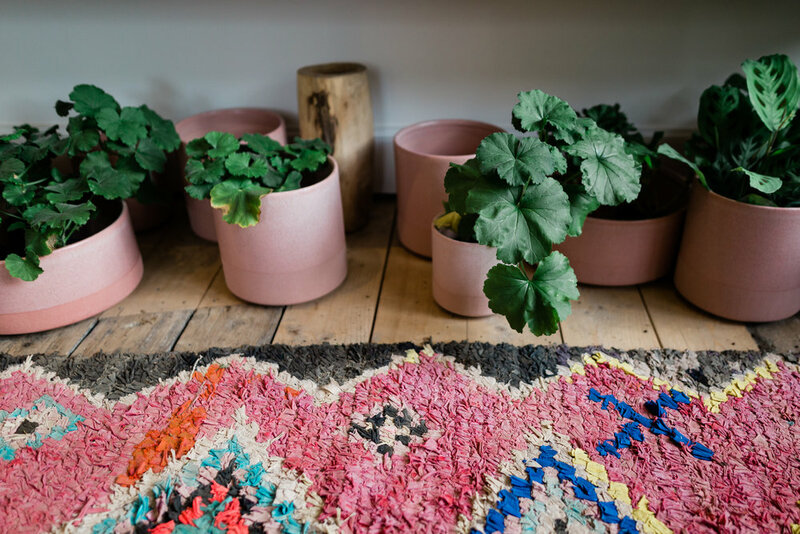 It wasn’t so long ago that the mention of eco-friendly homewares conjured up images of bland and boring, non colour, scratchy fabrics and furniture made from old shopping trolleys and repurposed tyres. With much more awareness to the damage being done to our planet from plastics and overflowing landfills, designers have started exploring more sustainable alternatives and natural materials and even some high street retailers are now producing eco lines to sit alongside their main ranges, such as H&M Home’s Conscious range. Creating an environmentally-aware home has never been easier and the choice of products never more abundant, but there’s still confusion for consumers about what actually constitutes ethical? One of the areas of product design that has evolved the most is the use of repurposed items to create covetable homewares. Pioneers in this area such as London-based salvage company Retrouvius and Herefordshire-based Baileys Home have paved the way, demonstrating the use of industrial salvage within our homes, in a cool and interesting way. 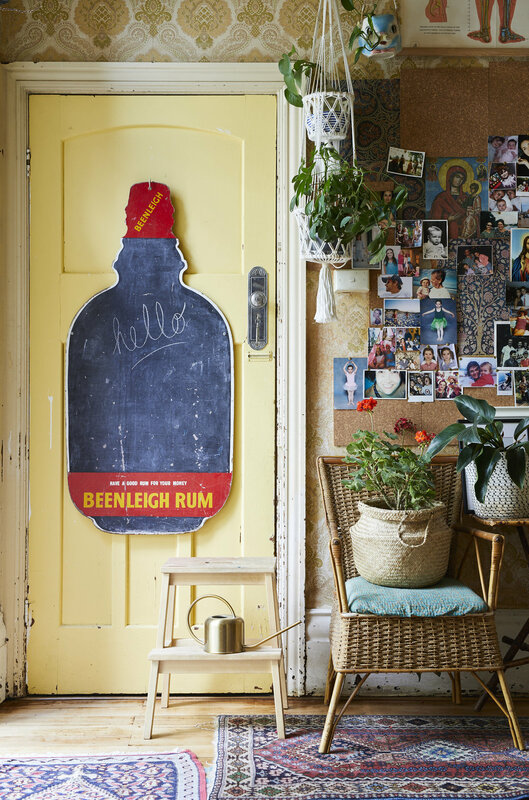 Items that would have been destined for the skip such as old school chairs, factory lights and redundant retail signage are now making a design statement within our homes. The trend for natural linen bedding over the last few years has largely been driven by both its aesthetic quality and our growing environmental awareness and better knowledge of manufacturing techniques. Linen, bamboo, hemp and organic cotton bedding and fabrics are produced without the use of pesticides and chemicals. Both linen and hemp are extremely durable fabrics which should last a lifetime. Avoid any fabric product that says non-iron on the packaging, this will have been produced using petroleum. Look out for cork homewares for an ethical option. Cork is probably one of the most naturally sustainable materials, regenerating itself repeatedly, growing back under the bark of the tree after it has been harvested. The tree can be harvested many times during its lifetime, which can be as long as 200 years. Natural flooring such as sisal, coir & seagrass are also both tactile and practical and rug companies such as Armadillo produce beautiful decorative designs. Reclaimed timber flooring, although expensive, creates a surface that at once looks inviting and warm and with a beautiful patina created over years of wear. Look to use parquet floor reclaimed from old school gyms or iroko and teak worktops from old school labs. These can all be sourced from salvage yards. Look at Salvo for a guide to some of the best and check auction sites, one person’s scrap is another’s gold. The most interesting interiors play with contrast, rough with smooth materials such as marble with wood and polished concrete with stainless steel. Juxtaposing old with new is a perfect way to create eclectic, interesting décor. Mix sleek contemporary designs with vintage and salvaged items, hand-crafted items with foraged and found pieces. A perfect example of how beautiful this can look is the Japanese technique of Kintsugi, the art of repairing broken pottery with lacquer mixed with precious metal. The distance some items have to travel from production to consumer, impacts on its carbon footprint. Lots of small independent shops stock products made within the UK and many stock local makers and artists work. Also trawl maker markets and vintage homewares events in your area, such as The Vintage Home Show. Seek them out and your home will have an individual look and a story attached to every piece within it. It’s always interesting to know the provenance of a piece. Another great idea is to attend a workshop with a maker - learn a new skill while also making something truly individual. 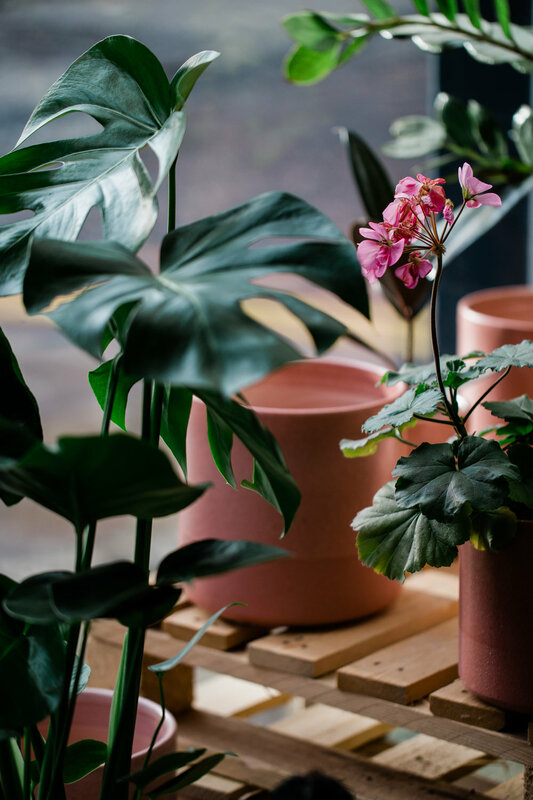 With so many of us working from home on our laptops & computers and shopping from our phones, it’s no surprise that one of the biggest trends to emerge over the last few years is the return of house plants. These little green babies are adept at soaking up carbon monoxide and releasing oxygen as they photosynthesis, purifying the air for us. Surround yourself with them and make your home an urban jungle. Many towns and cities have seen dedicated plant shops opening up, where you can purchase unusual species and receive the specialist knowledge required to care for them. Traditionally household paints contained VOC’s - ‘Volatile organic compounds’ - or chemicals which gave them their strong smell which could be toxic and in some cases cause ill health. Many companies started produce low-VOC paints. Low however, only actually means compared to other paints on the market. There are currently no regulations to define low. But now there are brands producing non-VOC or eco paints which can be determined by checking the label: look for wording such as non-toxic or natural. These are microporous and allow the walls of the building to breath and are ideal for period properties. They also often provide a lovely chalky matt finish. We all like our homes to smell lovely and fragrances help to discard cooking and pet smells. An alternative to toxic, chemically-produced sprays and plug ins are soy-based candles made with naturally-scented oils - an effective and eco-friendly way to fragrance your home. If the candle is in a recycled or repurposed vessel, even better. Online retailer Orchard Cheshire sell some lovely vegan candles in repurposed vintage French confit jars. There are also some beautiful exotic smelling incense sticks and cones widely available which emit a fragrance when they are burned and natural reed diffusers with essential oils are very effective and long lasting. Thanks to Karen and Kirsty for all of this sage advice and lots of shopping tips too. Be sure to check out Kirsty’s gorgeous cork lighting at Nove Lighting and Karen’s fab vintage finds at The Old Potato Store. Being environmentally conscious is something I now find myself thinking about on a daily basis, whether it’s a smaller purchase such as a new pair of jeans or which washing powder to go for, through to larger items such as what type of car we should go for when we replace our current one. Much of the changes that we can make start within the home, and there is so much we can do in terms of consumerism, repurposing and recycling. Natural Style Living is the latest book from stylist Selina Lake, and as always, is a book which is not only beautiful but also has purpose. Selina explores homes which have been created with materials in mind, where homeowners are thoughtful about the process of creating a beautiful home, while limiting their impact on the environment. Selina also gives advice on eco-friendly materials, repurposing, recycling and decorating with natural objects rather than man-made. Selina always manages to find the most amazing homes to include in her books, and this collection is no exception. One that particularly caught my eye was the home of Susannah and David Le Mesurier, whose home has all the modern rustic charm you could ever wish for. The light walls and floors are warmed up with vintage furniture and rustic wood, with pieces from the likes of Baileys Home & Garden and I gigi. One of the best ways of reducing your impact is simply by being considered in your purchases. Not being swept up by consumer marketing but being really thoughtful about what your home needs. Sticking to a neutral palette and natural materials means everything in Susannah and David’s home goes together effortlessly. You get the feeling that they only buy objects that they truly love and spend time sourcing those perfect vintage items. 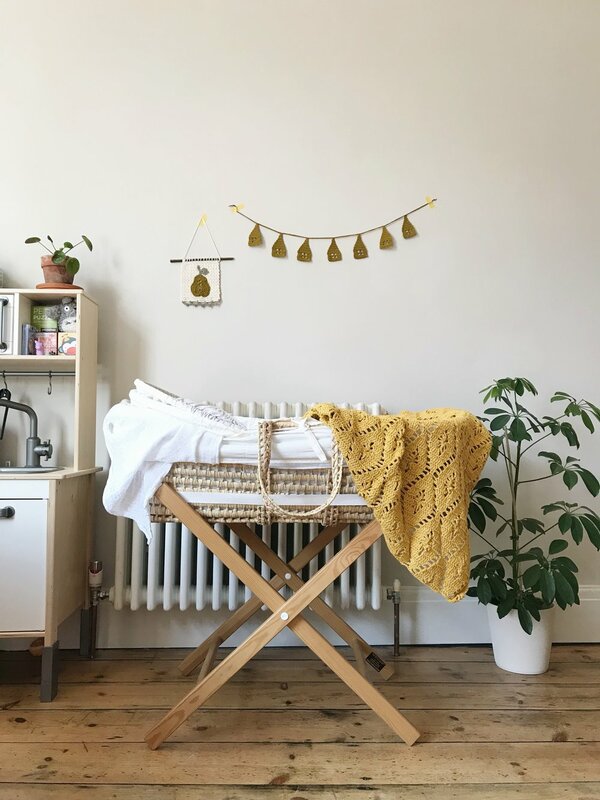 Enjoy the little peek at this lovely space, and then do check out Selina’s book for more beautiful homes and tips for making your own home more sustainable without compromising on style. 91 contributor Hannah Bishop chats to Swedish blogger Janniche Kristoffersen about her effortlessly stylish home which has gained her a substantial following on Instagram. Tucked away in the south of Stockholm city is the leafy suburb of Bagarmossen, or ‘Bagis’ as it’s known to the locals. This is where blogger Janniche Kristoffersen and her husband Johan moved to after the birth of their daughter Rio. The couple previously resided in trendy Södermalm, but wanted to be closer to nature so sought out a townhouse with a garden. Their new neighbourhood later lent its name to Janniche’s blog Blogga I Bagis (Blogging in Bagis). Initially, Janniche and Johan were enchanted by the old charm of the house, which was built in 1954. Though it wasn’t the most beautiful house they’d ever laid eyes on, with it’s bright, garish yellow exterior and old fashioned interiors­, there were original features such as wooden floors and a fireplace that captured their imagination. Janniche opts for modern minimalism, and describes her interior style as Nordic, with a mixture of old and new. 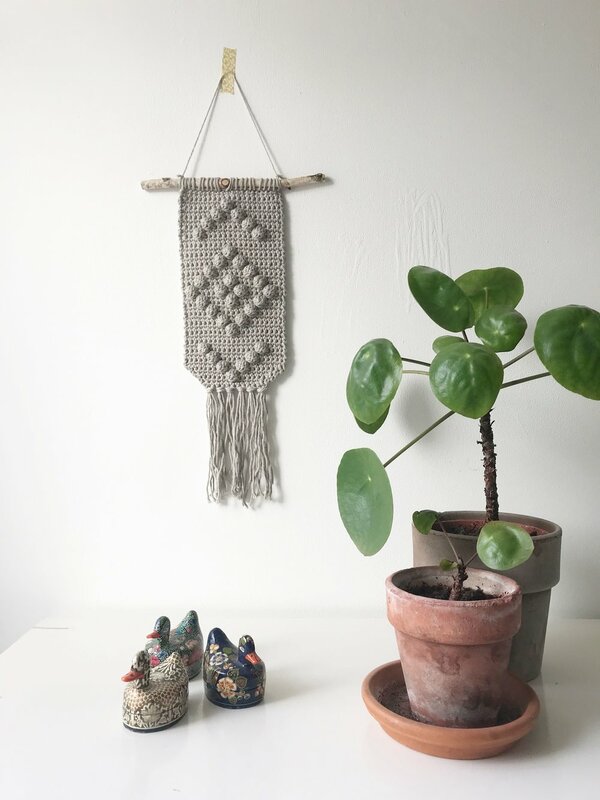 She explains, “I like a calm base, but add details to it for colour and texture.” Janniche regularly declutters the house, keeping objects she really likes and moving things around to bring new life to ‘old’ features. The kitchen is compact, but it feels airy, and light spills in from the windows that look out on the garden. A wooden shaker kitchen from Skandinaviska Shakerkök creates a hub where the family spend most of their time eating together, playing board games and socialising. One of Janniche’s favourite objects is a painting by her grandmother which hangs in the dining room - a daily reminder that creativity runs in her family. Her husband Johan is also a creative. He works as a photographer and artist, so the walls of the house are adorned with photographic prints and interesting art, adding pops of colour to their minimalist space. In the living room, there’s a collection of art books and magazines displayed with their covers facing out, inviting visitors to delve in, read and relax. Janniche explains that her favourite features of their home are the parts they’ve built on their own and made from scratch. For example, the large table which sits proudly in their dining room was crafted by themselves. Her latest project is a custom-made desk and some shelving solution for the children. 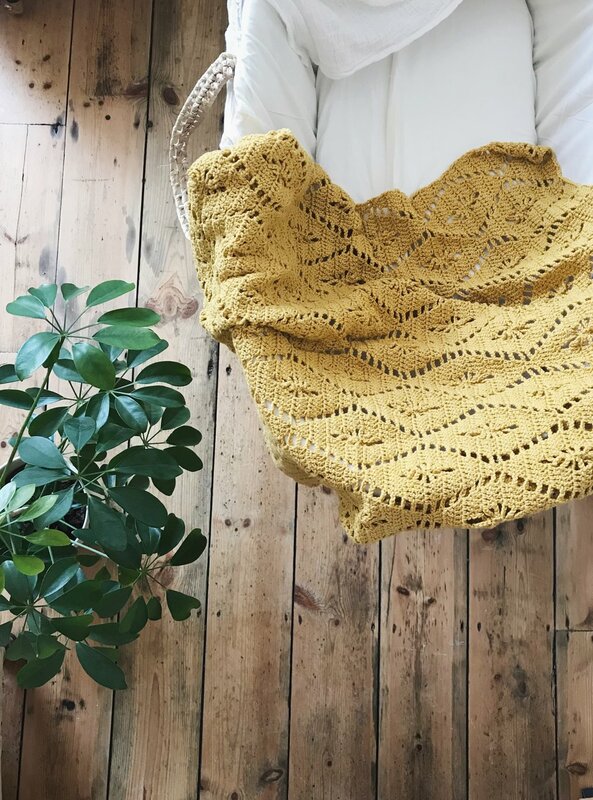 Read more about Janniche’s home on her blog or follow her on Instagram. I’ve always loved the idea of having a beautiful shop. In fact I did run an online shop for a while about 10 years ago, but there is something particularly alluring for me about an actual bricks and mortar shop. The curation of lovely objects, the display and styling, the textures, the smells… all the things that can only be experienced IRL. It’s a bit of a pipe dream really, I mean lets face it, I’ve got enough on my plate! But, in the last few weeks I’ve managed to make the next best thing a reality…. I have curated a collection of beautiful items from UK makers and designers which are for sale in Mad Lilies - a wonderful independent florists and homeware store in my own village of Banstead in Surrey. When I moved here a couple of years ago, I found myself often popping in here for a browse or to buy shoot flowers and soon got to know the lovely owner Alison and her team. 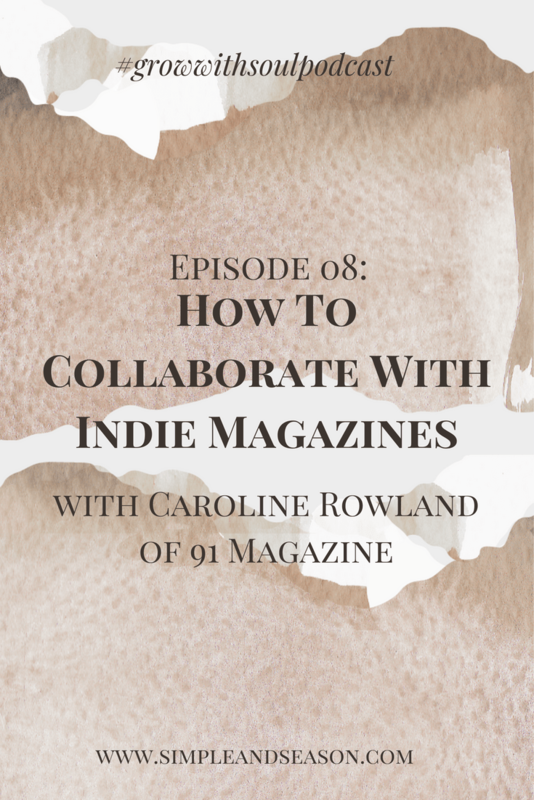 Alison started stocking the magazine in the shop, and collaborating together became an obvious next step. I’ve taken over a small section of the shop with a tightly curated range of items from some of my favourite indie makers and designers - some very local to us here in Surrey, some based further afield, but all within the UK. There are ten brands included in this collection and many of the items I already have in my own home. 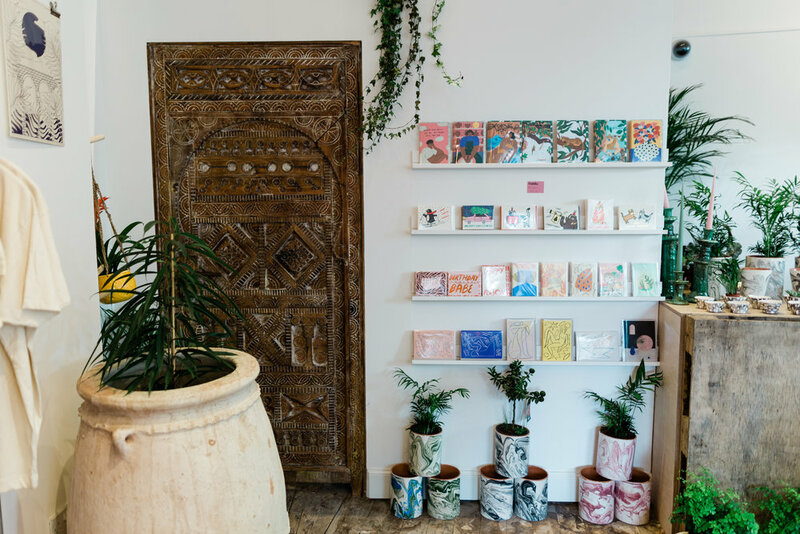 We have ceramics by two local makers - Raquel of Glaze Me Pretty and Hilda Carr - plus the dreamiest of organic skincare products by LA EVA - whose studio space you may have spotted in our last issue. We have beautiful illustrated prints and stationery from designers The Lovely Drawer, Hattie Maud, Katrina Sophia, Traces of Magic and Maggie Magoo. The cutest little woven pots by La Basketry and candles (which have been personalised for us!) by Helm London. I’m super passionate about supporting and promoting independent business, so it’s been such a joy to work with Mad Lilies and with all the designers involved to put this together. The plan is for the range to be on sale for an initial three month period, and then we will review it. Ideally, I’d love to continue and to add and rotate some of the work in the collection. If you are ever in the North Surrey area (Banstead is near to Sutton & Epsom and not too far from Reigate and Dorking) do pop into Mad Lilies for a browse. There is a lovely cafe opposite called Fego, perfect for lunch or even a few cheeky cocktails, and while you’re here, drive 5 mins out of the village to Louisa Grace - three barns packed full of gorgeous vintage and industrial furniture - it’s amazing. The Lavender fields are right there too (although they don’t open until June) or you can nip over to Banstead Woods where there is a Narnia trail and an amazing bluebell walk which should be coming into bloom soon. If you can’t make it for a visit in person, then Mad Lilies will soon launch their new Mad Lilies at Home website where you will be able to purchase items from the collection direct from your sofa. I will keep you posted on that via social media and our newsletter. Thank you to Alison at Mad Lilies for giving me the space to promote the wonderful independent creative community right here in my local village! Nearly three weeks ago we hosted our first ever ‘reader event’. I came up with the concept for a day event last summer, and decided 2019 was when we would launch them. (I was fully aware of how much planning goes it to running events!) It’s always nerve-wracking launching something new. Good old self-doubt tends to creep in, and initially I found myself fretting over whether the tickets would sell. Was my idea of a dream day out going to appeal to anyone else?! Thankfully, it turned out it was, and tickets were sold out about a month before the event. Phew! For me, curating a day out for 91 readers was done in the same way I curate the content for the magazine. The idea was to bring the magazine to life and literally base it around things that I love - independent business, beautiful shops and spaces, inspiring people, great food and creativity. The structure of the day is led by the hashtag I came up with a couple of years ago #seekinspirecreate (also the name of our popular e-zine), with the day being split into three parts - Seek, Inspire and Create. I’m so thrilled that our very first event which happened in Lewes, East Sussex in February went so well! We had a lovely mix of creative women come along (although men are very welcome too! ), some who lived quite locally, but some who had travelled the whole way from Manchester to join us! Here is a little insight into the day, with some lovely images taken by SarahLou Francis. For the first part of the day, I wanted to take everyone to a few of my favourite independent shops in the town. Whenever I visit anywhere new, I am always seeking out beautiful stores to browse, and Lewes is certainly packed with lots of them! We of course couldn’t get round all of them, so I selected three very different, but equally dreamy shops. First up was Marchand Son, the most unique paint shop you are ever likely to come across. Owner Simon previously ran a shop in London called 'Colour Makes Me Happy’, but moved himself and his business to Lewes around 6 months ago, bringing his quirky style to the town. Simon chatted to our group about the many myths surrounding paint, explained how he taught himself to make paint and shared the stories behind his brilliant paint names. He is a true creative who has built something entirely unique and it was wonderful to learn more about his business. He even mixed us little pots of ‘91 Magazine pink’ paint for our goodie bags! Next, we walked around the corner and onto the high street to visit Freight HHG. This beautiful store is run by Adele and her mother, and is a mix of homeware, clothing and lifestyle items. What makes this shop different is that the two women design or commission most of the items they sell. Adele chatted to us about how they avoid the usual trade fairs and prefer to seek out talented makers to craft their wares, with everything being made within the UK. Designs and materials are carefully considered to make products that last. It was lovely to hear the story behind how they have created their unique brand and everyone had the chance to ask lots of questions as well as to shop with our exclusive discount! Our final stop for the Seek part of the day was From Victoria in The Needlemakers. 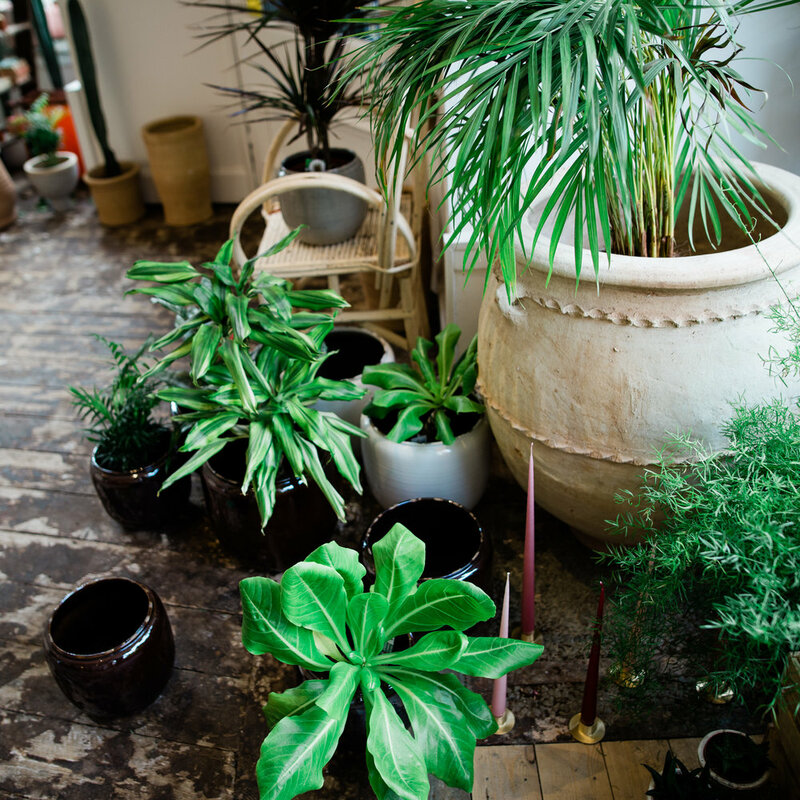 This gorgeous shop is an absolute treasure trove of homeware, gifts and plants. I could spend hours poring over the pretty things in every corner of this space run by the lovely Victoria. Surrounded by unusual hanging plants, cacti and tropical beauties, Victoria gave lots of sound houseplant advice to the group during our plant Q&A. Then we all eagerly browsed the goodies with many of us leaving with little brown paper bags filled with treats to ourselves! We were extremely lucky with the weather with the event falling during that really warm spell we had at the end of February. As we walked to the lunch venue where the INSPIRE part of the day would take place, we were shedding our jackets and talking of how spring-like it felt. The group were giving me slightly strange looks as I led them along the road to an industrial estate, I’m sure all wondering exactly where we would be eating! But, stepping through an unassuming door and passing by a noisy workshop area, all was revealed as we entered kitchen makers Inglis Hall’s beautiful showroom. The space is a working kitchen, so was perfect for out caterers Caccia and Tails to come and prepare the delicious lunch while we all mingled and chatted. The table looked beautiful, decorated with plants from From Victoria and gorgeous flowers by Bulb Floristry. Jam-packed goodie bags awaited our guests on their seats too. The food was truly delicious, with meat, vegetarian and vegan versions of mac ‘n’ cheese along with an amazing salad and focaccia bread. After eating and chatting, we then had two excellent talks to listen to. Firstly, Dorte and Georgie of Social Pow Wow talked us through using Pinterest for business. So much useful information was shared and I have a renewed love of Pinterest ever since! Next, Jade Golding, a creative business coach (and owner of two other businesses!) talked about how to inspire your customers online. She explained the difficulties faced with selling product online and then provided useful ideas on how to overcome these and create an inspiring online shopping experience. With tummies filled, brains inspired and goodie bags in hand, we set off to our final destination for the CREATE part of the day. Inside the fragrant AS Apothecary store, we were warmly greeted by owner Amanda who quickly made us feel at home in her beautiful space. 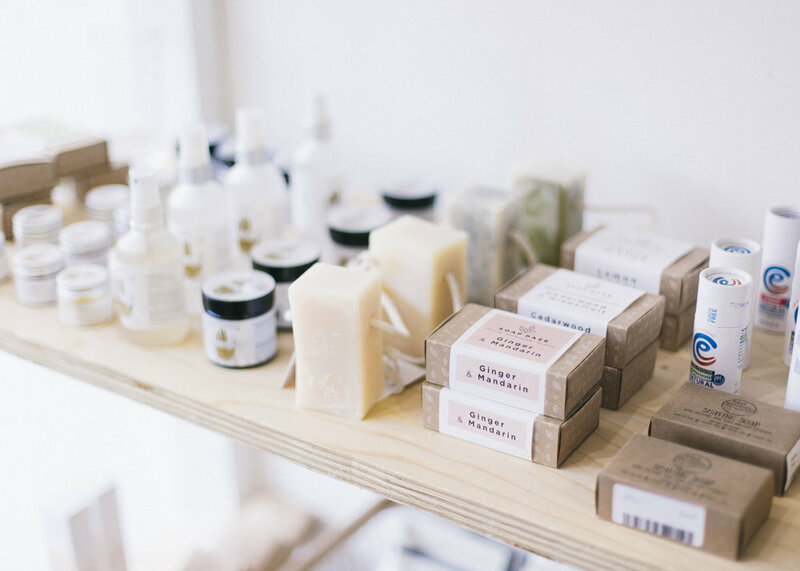 Her small-batch natural skincare products line the walls, styled to perfection with plants and other natural objects. Amanda chatted to us in depth about natural skincare and how she creates her range from flowers and herbs that they grow and harvest in Sussex, Scotland and Greece. She has a wealth of knowledge on the subject and I’m pretty sure most of us were converted by the end of the chat. (Many of us were purchasing her products before we left!) We then got the chance to mix our very own beauty balm, which we worked together to make under Amanda’s careful supervision. We all got to take away a little pot of what we made, and I have not stopped using it since that day! The day was rounded off the only way it could be; with a cup of tea and some delicious (and beautiful!) cakes supplied by Flint Owl Bakery! yum! As I said during my introduction at the start of the day, I basically wanted to create my ‘ideal day out’ and as the event drew to a close, I was happy to confirm that it had delivered exactly that! It was so lovely to be able to share it with a wonderful group of like-minded women and it reminded me how good it is to step out of your usual day-to-day and just enjoy some time doing things you love, meeting new people and discovering new things. We are already starting to plan the next of these events. It will follow the same format but in a different town with different businesses and people. I honestly can’t wait! if you’d like to hear about when tickets go on sale for it, make sure you sign up to our mailing list for updates. A HUGE thank you to everyone involved in our day down in Lewes. It was truly magical! 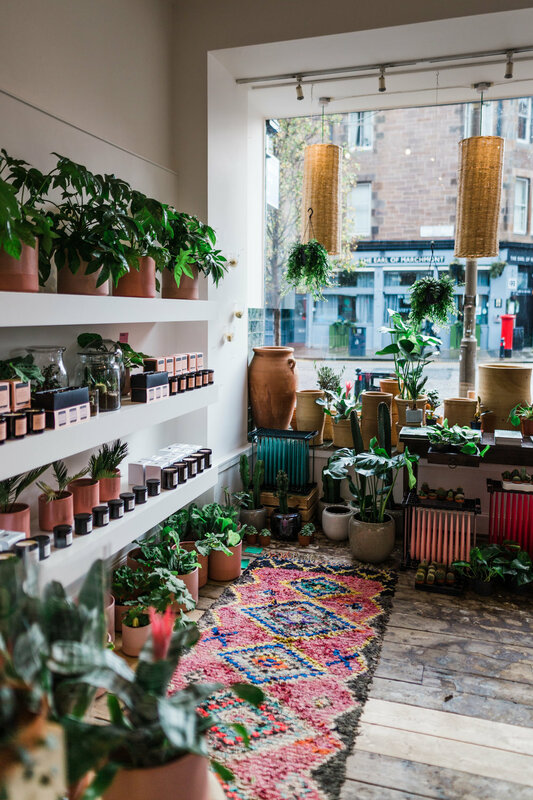 Located in Marchmont, Edinburgh, Dahlia has quickly bloomed into life, becoming a go-to destination for plant-lovers, stocking all you need to add some gorgeous greenery to your home and life (from the plants themselves to ceramics to house them and more). When and why did you decide to open Dahlia? From a result of always having a love for plants and nature as well as many years in retail, I decided to open Dahlia - with support from family and friends, the dream Iʼd been working on for a year became reality. What had you done before? Did any of these skills help? Prior to opening Dahlia, I had trained as a barista and also did a foundation year in art school. These experiences helped me immensely in both confidence and in being able creatively run my shop, always having an eye for new products and merchandising. I knew from the beginning that I wanted our name to be along the botanical lines but something that I hadnʼt seen before! After about a week of researching flower names landed on Dahlia and it just felt right after that! How would you describe Dahlia’s interior style? Colourfully minimal. I like to group colours in certain areas of the shop, for example one of our most photographed areas is ‘the pink cornerʼ which is where we display our Boy Smells candles and all of our various pink ceramics! You're passionate about all things plants and plant-inspired, why do you love them so much? And why do you think other people do too? I think my childhood and going to the Edinburgh Steiner School contributes a lot to my love of all things green. I have always enjoyed being outdoors and being able to bring a bit of that inside is always a positive. Additionally, I think that due to life being so fast-paced and technological these days, having a bit of greenery in your home is good for your health, both mentally and physically. How do you source your gorgeous stock? We source our stock from multiple places. A lot of our ceramics are handmade in Morocco which makes them all very individual and special. Instagram is also an amazing tool in finding new makers! There are so many talented local artists showcasing their work these days. 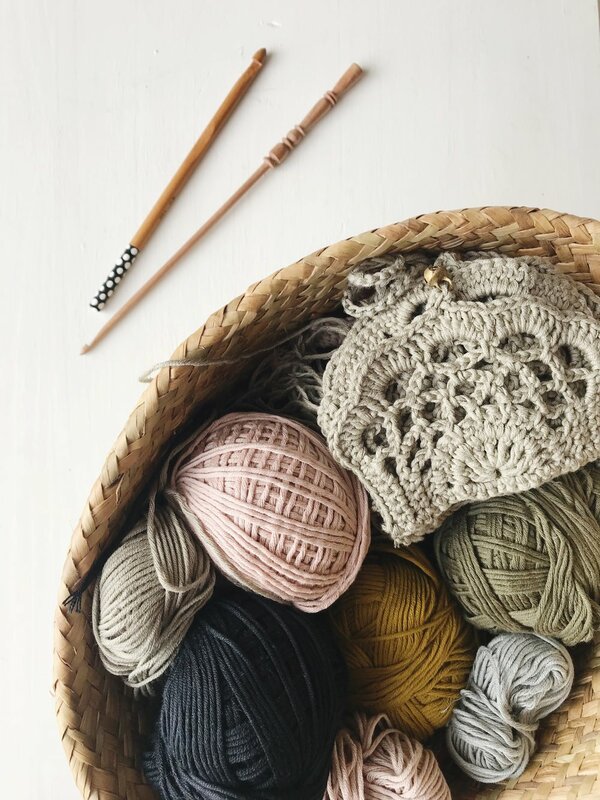 Do you create any of your wares in-house? Last year I started to read up on terrariums. I love the idea of being able to create mini green spaces in sourced glassware, as well as them being incredibly easy to look after. 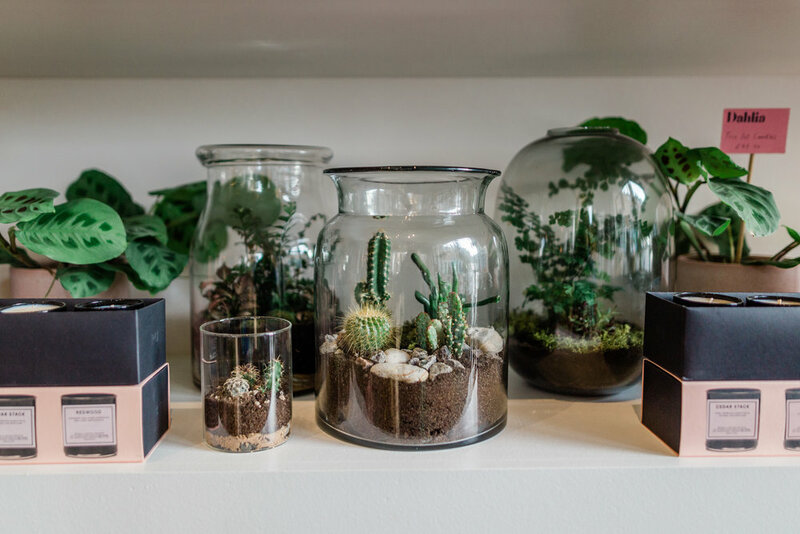 I make our terrariums both in store and at home in Leith. Which item is your bestseller? Why do you think that is? Our matte painted ceramic pots have always been our number one item! Weʼve had them since day one. I think due to the vast amount of colours they come in; thereʼs a pot for everyone. As well as our pots, our best selling plant has got to be the pin-striped calathea. We get a lot of questions as to whether they are real or not due to their very distinctive blush pink stripes running up their leaves. Which is your personal favourite? My canʼt-live-without would have to be all of our small cacti and succulents! Along with our range of small matte paint pots they all fit into - theyʼre our most favourite pick up item for birthdays, thank you gifts and all occasions! You have a loyal Instagram following, how has social media helped Dahlia to grow? Instagram has massively helped Dahlia establish a name for herself! Although being fairly centrally located, weʼre a bit far out for some of our customers, so being able to post regularly showing all of our new pots, plants or candles is really helpful for people who may have to make a journey to see us! Instagram has also allowed us to get to know our customers and other local businesses on a more personal level which has been lovely. Do you have any top tips/advice for those thinking of starting their own store? My advice would always be to trust your own instincts and really believe in what youʼre wanting to share with the world. Starting your own business isnʼt easy, but when you are truly passionate about what youʼre doing, it’s the most rewarding thing in the world. Expect to make mistakes along the way but try to remember them and grow from them, because they will have happened for a reason. Before I tell you more about this book, I should firstly tell you that I was actually part of it’s creation. I worked on it as their freelance picture editor, sourcing all the imagery to accompanying the words, which basically involves a LOT of research, followed by contacting the various photo agencies and photographers to negotiate costs, then finally gathering all the high res files and managing spreadsheets of file names, photo credits, pages numbers etc. I wrote a post last year about a new wave of interiors books, and how I’d noticed a shift in the interiors books that were being published. This is another example of that - with it’s smaller size (A5 roughly) and a very different format in terms of the content. The book is in Q&A format - the questions being common design dilemmas which Joanna then provides ideas, suggestions and advice to these problems. Examples of questions are ‘I live in a new build - how can I add character?’, ‘How do I tackle a north-facing room?’ and ‘What can I do with my unused fireplace?’ Joanna’s responses are practical and useful, while the images provide visual inspiration accompanied by captions that highlight why the space has worked well to combat the problem. Interspersed throughout the book are spreads highlighting specific topics such as ‘when to invest and when to save’, ‘how to unleash your inner designer’ and ‘essential DIY staples’, where Joanna dives into more detail and shares her years of experience working in the interiors industry. What’s lovely about this book is that is it easy to dip into now and again with it’s snippets of information and tips, but not only that, it feels accessible. The homes that are pictured feel attainable and real - even my own home is in there, and believe me that is very real and done on a tight budget! It’s the perfect read for anyone who is embarking on decorating their first home or if you are about to makeover a space but just don’t know where to start. It demonstrates that you don’t necessarily need big budgets to create a beautiful home - just a little insight from someone in the know, giving you that nudge to unleash your creativity! The book published just this week and is priced at £14.99 - Preview further and buy here. Today we have the next in our series of ethical living posts; this time turning our attention to fashion. 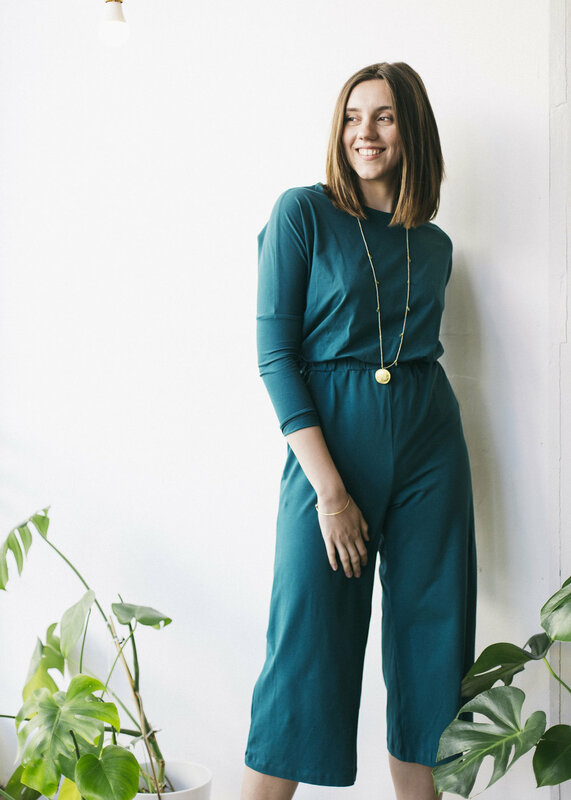 Capsule wardrobe expert Jessica Rose Williams shares her insight and a few tips on how to made a difference to the planet by being more conscious of how you shop, discard and care for your clothes. I blame ignorance for my poor track record with fast fashion. Until switching to a minimal lifestyle, I never gave a second thought to who made my clothes. I never considered how they had been made, what chemicals had been used in the process or how the company had disposed of their waste. I’d think nothing of buying cheap clothes with a view to throwing them away after only wearing them once. They say you can’t turn awareness off and this has been true for me when it comes to the ethics of the fashion industry. Second to the meat industry, fashion is the largest polluter on the planet and concern over our ever faster curing wardrobes is escalating. Fifty three million tonnes of clothes are produced globally each year, of which 87% ends up in land fill. With documentaries like The True Cost and Fashion’s Dirty Secrets blowing the whistle on the retail giants who don’t seem to care what devastation they leave in their wake, there has been an inevitable increase in the desire to turn our attention and wallets to ethical fashion. If fast fashion is the problem, the answer is to buy less but better and slow down the turnover of our wardrobes. The good news is that there are endless simple ways we can do this. Here are seven easy steps you can take to get started with ethical fashion. As tempting as it can be to wipe the slate clean and start all over again with a purely ethical wardrobe, this is not the answer. I went through a phase of feeling ashamed of owning fast fashion brands, as of course, I’d rather own a purely ethical wardrobe. I moved through this on the realisation that we’re all learning together and throwing perfectly good clothes out will only add to the problem. The best thing we can do is to wear what we’ve got now for as long as possible so we’re not adding to the waste issue. Moving forwards, when it does come to replacing pieces, then this is the time to exercise our new found ethics. One person’s trash is another person’s treasure. Hit wealthy areas for the best pick of charity shops. Vintage stores are also enjoying a moment right now, but these can be tricky to find depending on where you live. If you’re a London dweller for example, you are lucky with a wealth of options including the likes of Portobello Road. If not, then online stores such as Retold Vintage, eBay, Depop and Vestiare Collective are great places to start for the rest of us. Bloggers are also waking up to sustainability issues surrounding fashion and selling their gorgeous wardrobes off regularly. Keep an eye out on their Instagram feeds for bargain pieces. Thank goodness for the internet! We can thank it for connecting us to brands who are creating beautiful clothes with consideration, compassion and with the intention of them lasting us longer than the latest trends. Ethical brand directories are plentiful and I find these are the best way to discover new brands. 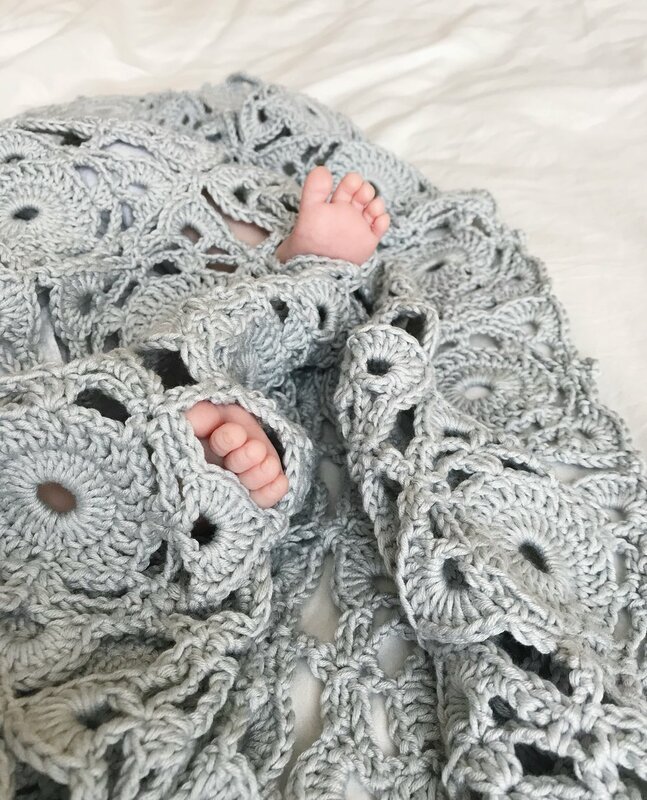 I have my own directory of favourites on my blog but Allison Simmonds, Field and Nest, Candice Tay and morethislessthat also have great recommendations. Get to know your favourite brands, there are some beauties out there. Brands such as Nadinoo, Stalf, Will’s Vegan Shoes, Thought clothing and People Tree are among my current favourites and suit a range of budgets. Some fabrics are more sustainable than others. 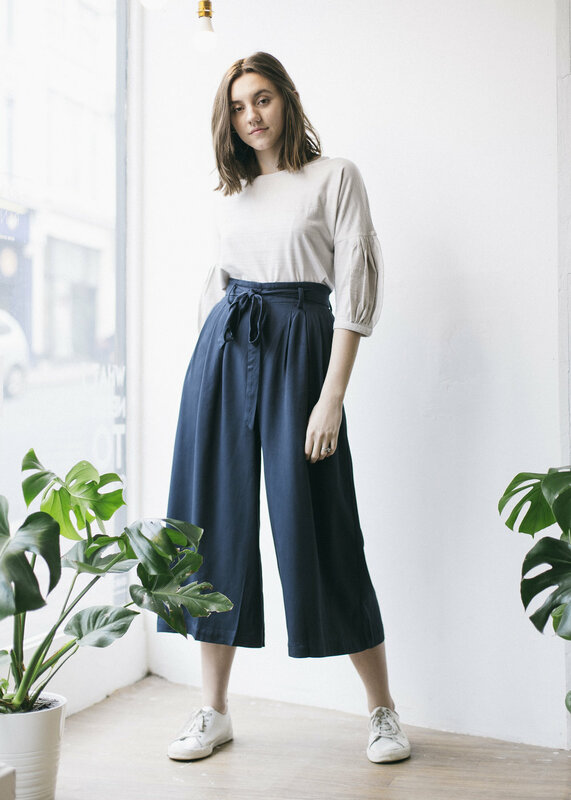 Organic cotton, linen and bamboo are favourites amongst the ethical brands, although there is an argument that natural materials aren’t always kinder to the environment, with some polyester requiring less energy to make. This can become a minefield, but sound advice is to simply consider the company’s manufacture methods before making a purchase by checking their ethics policy on their website. Before you buy anything new, take a few moments to consider if you really need it. Do you already have 20 stripey tees and another one isn’t really going to add anything new to your wardrobe? Could you ‘shop your existing wardrobe’ and repurpose something you’ve already got? Assess the ethics of the company you’re looking to buy from and always ponder if you can see yourself wearing this new piece you’re swooning over for years to come, or is it just for one night? If yes, maybe you could borrow something from a friend instead or look to hire an outfit. Anything you can do to slow down your wardrobe will help the cause and boost you up the ethical charts. We’ve run out of excuses when it comes to clearing out our wardrobes and dumping our cast offs in the bin. This simply is not sustainable and is having horrific consequences on our planet. Clothing banks where we can recycle or donate out clothes are scattered throughout the country and you’ll often see them at supermarkets, village halls or even in multi-storey car parks. The difference recycling can make is huge and this is always the best way to dispose of our clothes. Design inspiration is all around us. If you know of my first book, you’ll know I love a shop interior, but I also LOVE stealing ideas from cafe and restaurant interiors. When out for a meal, of course the food is hugely important, but generally you won’t find me snapping what’s on the plate, I’ll be busy trying to photograph the design details of our surroundings! I can’t see us ever running out of eateries to get inspired by, and Pinterest is the perfect place for a bit of cafe ogling…. You can check out our board for lots of lovely examples, but here is a little taster - a few places to perhaps add to your cafe bucket list…. The team and contributors behind 91 are genuinely what make the magazine and this blog work. I truly could not do it without them, so through this series of posts I want to share their work and get an insight into their lives. They are all are super-talented, interesting people that you should definitely be following. I’d also like to take this opportunity to introduce you to our new deputy editor, Huma Qureshi, who will take the reins from Laura Pashby. We are sad to see Laura go as she has been a fabulous asset to our team over the past 3 years, but we are also thrilled to welcome Huma and I know she will bring a special something to the pages of 91. We also chat with two other 91 contributors, photographer Kym Grimshaw and writer & stylist Claire Holland. If you weren't a writer and 91's new deputy editor what would you be and why? Hmm, good question! When I was a freelance journalist, I had a weekly radio slot on the BBC Asian Network and I absolutely loved it. I imagine that if I wasn't doing what I am now, I'd have loved to have explored the broadcasting side of journalism and presenting as opposed to the editorial. I loved being live on air on the radio, chatting away, and the quick-fire interaction with listeners and other presenters. So I suppose if I wasn't doing all this, perhaps I'd be in a studio with my voice drifting in through speakers somewhere! Name 3 of your favourite instagrammers and why? @brownkids I love how Roe & E, the couple who jointly run this account, have made their own version of what living with less means. I love their style and ethos and their emphasis on family. They make minimalism fun! @todaywecooked Claire cooks the way I'd love to cook. Her daily dinner photos are simply delicious, inviting and inspiring and I love her behind-the-scenes on her Stories too, when her little boys usually help her cook in some way. I'm not a very good cook but I've learnt a lot through Claire! @rajovilla Joya is a fine artist and her watercolours are exquisite; it is a dream of mine to one day own one - or if not an original, at the very least, one of her prints! I adore her feed for its soothing, sophisticated palette and the way she so beautifully blends her art with her Bengali heritage in such a romantic, historic way. Top tip for aspiring writers? Read the sort of writing you'd like to write yourself. It's all very well telling you to jump straight in and just write, but that's a lot harder than it sounds and I believe you have to have some idea of what you want to write before you start (although not every writer will agree). You have to work at being in that frame of mind in the first place and reading helps you reach that place. If you surround yourself with the words that inspire you, then you'll be more motivated to write yourself. Also: check your grammar! I haven't shopped for ages because I've reached a lucky place where I love everything that I do have but when I do shop, I prefer to do so with small brands. 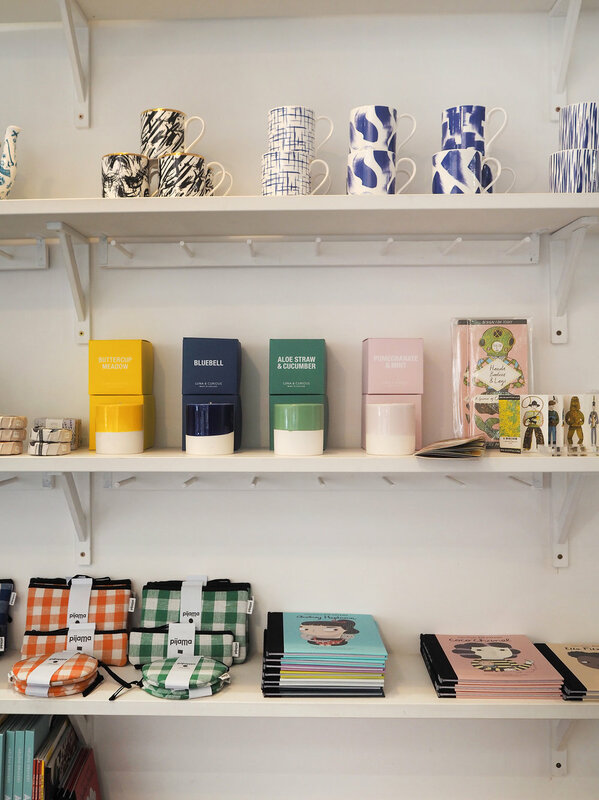 There's many I can think of but Tea And Kate has long been a favourite go-to store for gifts, homeware and art. I love big white hydrangeas for their blossomy, romantic feel. I love fiddle leaf fig trees for indoors and potted palms for outdoors. We stayed in a holiday home once which was filled with the most beautiful array of fiddle leaf figs and I immediately emailed the owner to find out what sort of plant it was and how easy it was to look after. He was delighted to share his advice and I take great care of the one we now have! We also have two small palm trees in our back garden and they remind me of far away places. London. It has everything. I especially love our little corner in north London where we live, but I love it centrally too. London is home. Kym is a food, lifestyle and travel photographer and she has also shot some beautiful interiors for us, such as the gorgeous feature on Albratross Cafe in the SS18 issue (Still some copies left!) Her Instagram feed literally makes you want to reach in and taste the food and experience the places she visits. Follow her at @kymgrimshaw and see more of her work here. If you weren't a photographer what would you be and why? That's a good question because I didn't expect to be doing what I am today! I think I would still be doing something creative, I used to work in visual merchandising so perhaps I'd have gone down the stylist route if not photography. Name 3 of your favourite instagrammers & why? @luisabrimble - apart from being in awe of her work, Luisa's generosity with knowledge knows no bounds. She has recently been sharing her studies and analysis of photography on stories and I find it fascinating. @cannellevanille - an all-time favourite, her food photography seems so effortless and natural but I also love the way she captures delicate day to day moments. @millykr - Milly is my go-to for travel tips or the best places to eat, I trust her recommendations will always be enjoyed. Top tip for aspiring photographers? What is your Netflix obsession right now? I've just started watching Russian Doll and I'm already hooked! My local greengrocer, Reg The Veg. I love admiring the beautiful produce and the change of seasons. A blush pink or peach dahlia, so beautiful. My monstera, it's not too fussy and easy to keep alive. Hoping it takes over the corner of my living room one day! It has to be Bristol, home for 6 years now and there's nowhere else I'd rather be. If you weren't a stylist/writer what would you be and why? When I was in my early twenties I seriously considered training as a psychotherapist, before life took me in a completely different direction. I’ve always been fascinated by how the human mind works and I like the idea of helping people, so I think I would be a therapist or a counsellor. @errer_ - because every single post is breathtakingly beautiful. @mskathrynho - because I’m a little bit obsessed with her abstract seascapes, and she takes beautiful photographs, too. @meganivygriffiths - I love her creativity and her sense of colour, and everything she makes I think, I wish I’d done that! Read a lot. The more you read (novels, reviews, essays, whatever), the better writer you will become. I normally have a novel and a non-fiction book on the go at any one time. At the moment the novel is Mrs Osmond by John Banville, which is taking me ages to finish as I have to keep re-reading his sentences because they’re so beautifully constructed. My current non-fiction read is Why Feminists Don’t Wear Pink And Other Lies by Scarlett Curtis that my husband bought me for Christmas. It’s made up of separate entries by the likes of Dolly Alderton, Helen Fielding and Emma Watson - perfect for dipping in and out of. There are so many! I’m loving reste in Hastings, as well as Goods and From Victoria in Lewes, but the holy grail for me is, and always has been, the wonder that is Liberty. This is also a tricky one. I’m in love with dahlias at the moment. I grew them in my garden last summer for the first time and I’m excited about trying some new varieties this year. I’ve also always had a thing for ranunculus and anemones, but I think I’d have to say the rose. I bought some new climbers a couple of years ago to train up the front of my house and when they’re all out in full bloom they're so pretty, and the scent is amazing. It has to be the Monstera. I fell totally in love with Ghent when I visited last summer - it’s so pretty and steeped in history, but also young and vibrant and full of interesting little independent shops and restaurants. I also adore Florence and Venice for their sheer beauty, but right now the city that makes me happiest is Brighton. I left London to live in the East Sussex countryside a few years ago and I still miss it from time to time. So when I feel I need the creative buzz of a city, I head to Brighton. 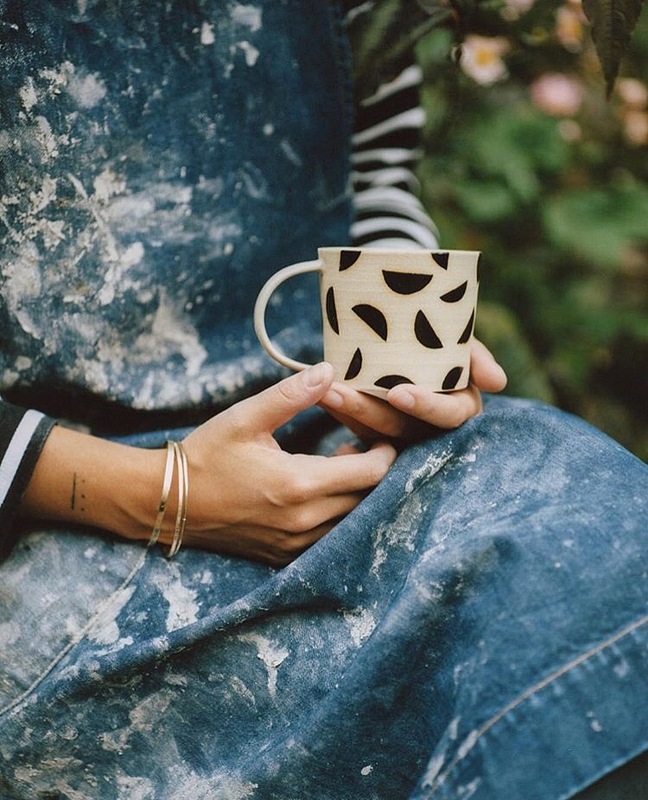 London-based contemporary ceramic artist Hannah Bould creates handmade and wheel-thrown works with a graphic, painterly style. Hannah tells us more about her business, and her passion for individually crafted pieces. Hi Hannah! How would you describe your ceramic work? 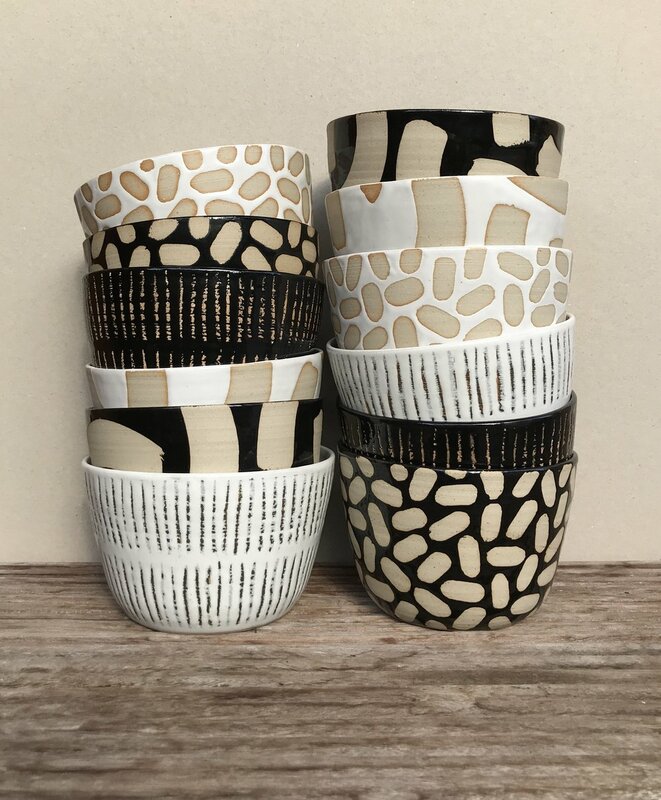 I make functional stoneware pottery, with geometric bold shapes and expressive painterly marks, primarily using wax resist to decorate my monochrome works. It happened very organically. It had definitely been a dream of mine to set up my own business, but the process was more of a gradual set up. I started with a couple of small wholesale orders, which I would fulfil in my spare time, and that then led on to more orders. Eventually I quit my job to focus solely on my business. I also did an internship, which gave me confidence in my skills, and belief in my own work. Over the years, it has developed slowly as my output has increased and my needs have changed. Aside from various nannying jobs, I worked for six years at a fine art print studio in East London as a studio assistant. My role there involved paper handling and print finishing. What’s the ethos behind your business? I have always prioritised the handmade nature of my work, and endeavour to remain excited about all the individual pieces that I make. As much as possible, I like all my works to be one of a kind, and am open to all forms of collaboration. What’s your creative process at work? I use a white stoneware body for all of my work, and black, white and transparent glazes exclusively. I really enjoy experimenting with various forms of wax resist and like to let the form of each piece dictate the pattern or glaze application. When it comes to decoration, I like to work quite quickly and instinctively, and don’t deliberate too much. I work in my garden studio in North London. It’s small, but perfectly formed! I studied illustration at Camberwell College of Art, and started pottery evening classes in 2012, from there I just practised loads - with a lot of failed attempts at first! It has definitely evolved, in that I have honed my skills and refined my techniques, but the imagery and mark making is derivative of my old illustration and printmaking work, so I can see a direct correlation between the two. How do you balance producing handmade works, with the online world? Not very well! I tend to get very involved with the making process and am not a very computer-y person - it’s something I definitely need to improve on. My own online shop is hardly ever stocked which is terrible! On the other hand, I love how Instagram is a very quick and easy way to give an insight into my day-to-day work. How valuable is the online community to your work? Instagram is invaluable to me and has led to most of my orders, and I’ve always found it to be a really positive environment. I find inspiration through experimentation - I am definitely more of a do-er and less of a thinker. The process itself inspires me and find I’m most creative when I’m busy. Working as an independent maker – what are the joys, and what are the challenges? I can’t imagine working in any other way now! I really enjoy being able to explore an idea on a whim, and I like that I can physically spread out in the studio without getting in anyone’s way. Having said that, being my own boss means I often work long hours and feel guilty if I’m not in the studio. Which pieces do you most love making? I really enjoy making anything new, and anything with handles! Trimming is my favourite part of the whole process. How did you first discover a love for what you do? At the very first pottery evening class I did, I fell in love with clay and became completely addicted to throwing, I find it really therapeutic. Quite soon into making ceramics I realised how many avenues there were to explore, and I feel there has been a clear trajectory from the those early lessons to now. I usually like to get into the studio around 9am and then throw until midday. I’ll then spend the afternoon either trimming the previous day’s thrown pieces, or do a bit of glazing and decorating. I like to vary the tasks I do each day, but that being said, I do strangely love a repetitive task! I try to keep my Instagram fairly up to date, and like it to reflect what I am doing here in real time. I think it’s important to take good pictures of my work, but that’s about it! Throwing live on Selfridges shop floor was a great experience, and being asked to do a professional talk by my old pottery teacher was another highlight for me. And it’s been great expanding my home studio and taking on a new studio assistant - my dog, Fig! Where do you sell your ceramics? My stockists include Toast, Venner in Walthamstow, Form lifestyle store in Manchester, Frank in Whitstable, Hunter Jones in Rye, Ondine Ash in Falmouth, the National Centre for Craft and Design, the Design Museum, and others! I’m currently working on an order for Tavern shop in China, which I’m really excited about. I also have a very exciting collaboration in the pipeline, but I’m not sure I’m allowed to mention the details just yet…! Do you have any creative pastimes or hobbies? Mostly, it’s walking my dog Fig on the heath - I don’t get time for much else! Any advice for makers just starting out? I would simply say practise your craft a lot, and make loads of work! Radio on, and hot water to throw with! Sea, if the sun is shining! Night owl… wish I was an early bird! Not to worry so much! Whether you are just launching a new business or developing an existing one, your visual identity is a hugely important element of getting your brand noticed. Interior stylist Nancy Straughan (@nancy_straughan) shares her experience and advice on how to find your own visual style. Designing a cohesive visual theme for your brand and business can often feel like a daunting task if it’s not something that comes naturally. First of all, figuring out your personal style can be a minefield in itself, and then actually establishing that look across various platforms can feel like a mammoth undertaking. We all want to have a recognisable style, and know that it is essential to building a brand and growing a business, but what are the steps to actually creating one that you love and that others will love too? Whether you’re a maker, designer, service provider or influencer, having a recognisable style is so important for gaining a following and customer base. 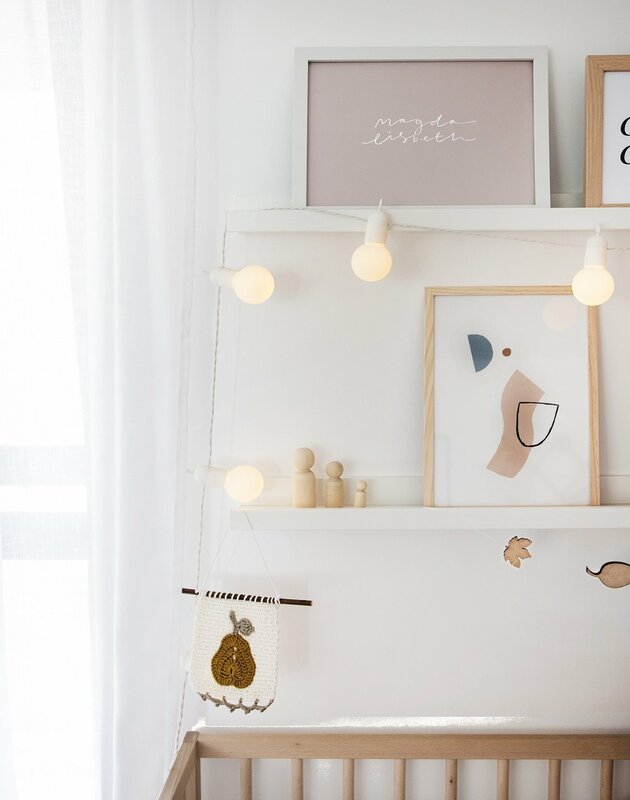 When I decided that I wanted to rebrand my homeware business to become an interior and prop stylist, I knew that I needed to focus on finding my style. What I discovered is that you can’t develop your visual identity through research alone, you have to get out there and practice. When I began designing my new logo, blog and website I jotted down words that spoke to me. For example, terms such as ‘hearth’, ‘forest’, ‘home’, ‘nurture’ - these may sound totally random but they were the key to finding my visual style. All my words had a warm and homely feeling to them and all tied together with elements of nature. When I look around my home that’s exactly what I see. A cosy space filled with treasures, dried flowers and a calming colour palette of muted peach, olive and navy blue. Once I’d established these describing words for my style it became so much easier for me to think about the sort of visual style I wanted my brand to have. Your style should be a reflection of your life simply because it will represent you so much better. I want someone to look at my work - be that something I’ve designed or a photo I’ve taken - and think “yes, that is so Nancy”. So, think about what it is you really love? What style makes you feel happy or inspired? Start flipping through design books and magazines, write down the emotions you want people to feel when looking at your work, as well as those random words that you feel drawn to. Make a vision board of images that speak to you (either on Pinterest or on a large piece of card) and before long you’ll start to see patterns emerge. When it comes to Instagram, even if you are trying to promote products, people love to have an insight into your life. So I believe it is worthwhile to show people the beautiful things that surround you. That might be your home, your fashion, your work studio or places you visit around the world. Before long you’ll have a strong portfolio of images that represent you as well as your brand. Remember, it is all about editing and curation, so if you are a glamorous fashion blogger, showing photos of you hungover on the sofa with a pizza box is probably not how you want to represent you and your work! Likewise, for me, photos of designer high heels wouldn’t fit with my feed as my focus is my home and interior styling work - but what doesn’t work for one, can certainly work for another. To keep a level of coherency, make sure you stick with one photo editing process or filter so that your images complement each other. I edit my photos to have a warm peachy vibe, but you may want to go for high contrast or desaturated images, depending on your preferred look. While we are mainly talking about visual style here, do bear in mind the words that you accompany your images with. I happen to share quite a lot on Instagram about my life, but it really is up to you to establish your tone of voice. Generally I would suggest giving some meaning to your image, while drawing people in with a question or conversation starter. Try out a few things and see what feels right for you. I spoke to three inspirational ladies from different creative fields to find out how their discovered their visual style and why it’s so important. Nancy: When I look at your blog and Instagram page the main thing that jumps out at me is all the colour and fun! How do you ensure that your style shines through when there are so many other Instagram accounts based around colour as a theme? Lucy: Even though there are lots of colour-themed accounts out there, I tend to follow fashion influencers and sadly it’s rare that they will incorporate as much colour as I’d like! Maybe it’s the need to put out in the world what I feel is lacking in my life, that helps inspire me. I think there’s something to be said by not looking directly at images that you want to emulate, or else other negative factors such as comparison and copying tend come into play. Communicating optimism is very important to me so I won’t just consider the background and outfit I’m wearing but also my pose and facial expression to ensure that I’m lifting someone’s mood rather than making them feel bad about themselves. My ultimate aim is to make my followers smile with each post! Nancy: As a cake designer you have to work very closely with your clients, how do you strike the balance between creating something that represents your style whilst also making sure your couples are happy with the design? Vaani: Eating cake is about the senses to me: it's about the flavour, the smell and it's got to look like a feast for the eyes. With these senses in mind, my designs are led by my instinct to create buttercream cakes that are sensual, that capture beauty and romance. Over time I feel I've developed a strong portfolio and signature style, so that when clients commission me, I think they have a good idea of the kind of cakes that I make. Collaborating with my clients is really important to me though. I really value their input as this is what helps to create a cake that's unique to them. As I've taken most of the photos for my portfolio and my Instagram gallery, I think there is a consistency in the visuals. I love to create imagery that is sensual, atmospheric and sometimes a little moody which I think is what helps to unify my style, convey the essence of my designs and make it distinctive. Nancy: As well as managing a beautiful Instagram account and blog you also design and sell prints as well as teach brush lettering courses, how do you make sure that all these elements work together visually? Teri: As there are many different aspects to my business I’ve spent a lot of time considering how to make sure all of them are visually in keeping. I’ve always focused on creating a consistent style that runs through my blog and Instagram account, which comes down to the way I shoot photos, always using natural light and the colours I use as well as majoring on negative space as a theme. Obviously my lifestyle and interiors blog work overflows from that approach and images for my brush lettering workshops can be easily adapted to suit the mood and colour palette. I actually had a complete overhaul of my branding and shop products last year to bring them more in line with the look I champion on Instagram . Now I feel much keener to share this avenue of the business in amongst the rest. I think it’s all about being deliberate, deciding your aesthetic and sticking to it even if its tweaked and evolves a little along the way. If you’d like to learn more about curating your visual identity, as well as using social media for business, email marketing and photography, check out 91 Magazine’s upcoming workshops. Our next one is on the 16th March in Surrey. When and why did you decide to open Luna & Curious? The idea to open Luna & Curious was formed in April 2006. We opened in June 2006. 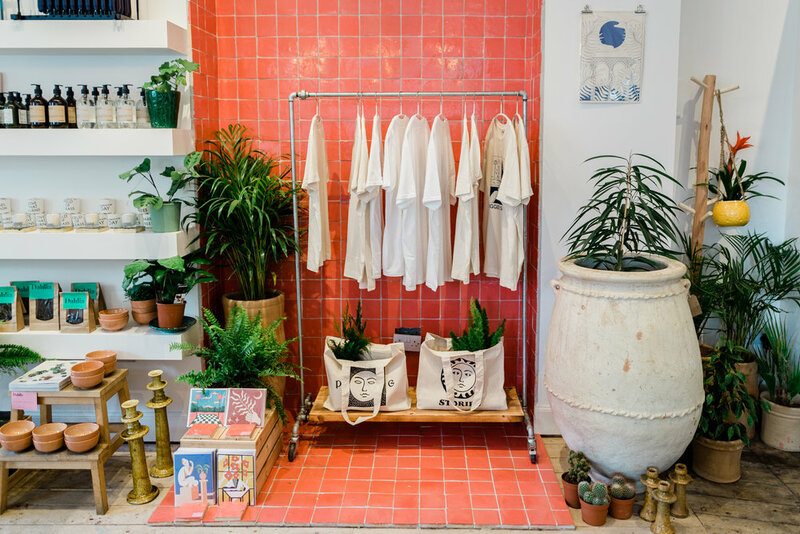 Luna & Curious began as a collective of seven designers who got together to open a shop to sell their own wares. It proved very successful, the ‘day-a-week-each’ commitment soon grew and was too much for some, with a move to bigger premises needed, we took on Luna & Curious as a trio. How would you describe the store’s interior style? From the outset, Luna & Curious has been white, any foray with colour has always been short lived. Influenced by Martin Margiela, white provides a unifying background for a varied range of distinctive products. You're passionate about British manufacture, why is it so important to you? Luna & Curious began in a time where provenance was not thought about, an era of mass production and consumption. We created a manifesto stating our rally against this way of living. One of our original focuses was the ceramic industry in Stoke-on-Trent. A world class hub of knowledge and skills for hundreds of years was shrivelling at a rapid speed. Makers were considered factory workers not craftsmen. In 2008 we went with Polly to visit the place that was making her work (now closed). We met three ladies (whose names were along the lines of Marjorie, Margaret and Maud) and we watched in awe as the trio, using an array of unusual tools, transformed clay into the most detailed and intricate ceramic flowers. They had all been working doing this job since they were 14. They were now all 60+. One had retired twice. When we expressed our wonder at their skill, they brushed the compliments away, they did factory work, as did their mothers, sisters, aunts etc. They thought we were the talented ones as we had been to university and had our own businesses. So. to surmise a very long answer, it’s because of the history and skills of the Marjorie, Margaret and Maud’s of Britain that we seek out to continue this heritage. Trade shows form a large part of our sourcing, we go to the main ones but also love a ‘rookie’ show. The more specific the better, this is where you will find the treasure. We also use every modern buyers friend, Instagram. Combined with trawling the internet for the minutest mention of traditional manufacturing. Provenance is a enormous consideration for us. We will only sell jewellery and greetings cards that are UK made. However it’s not all British, we look to Germany for wooden toys, Poland for Christmas decorations, Portugal for shoes. Environment, sustainability and worker welfare are also factors, a product is truly scrutinised before being welcomed into the Luna & Curious offering. 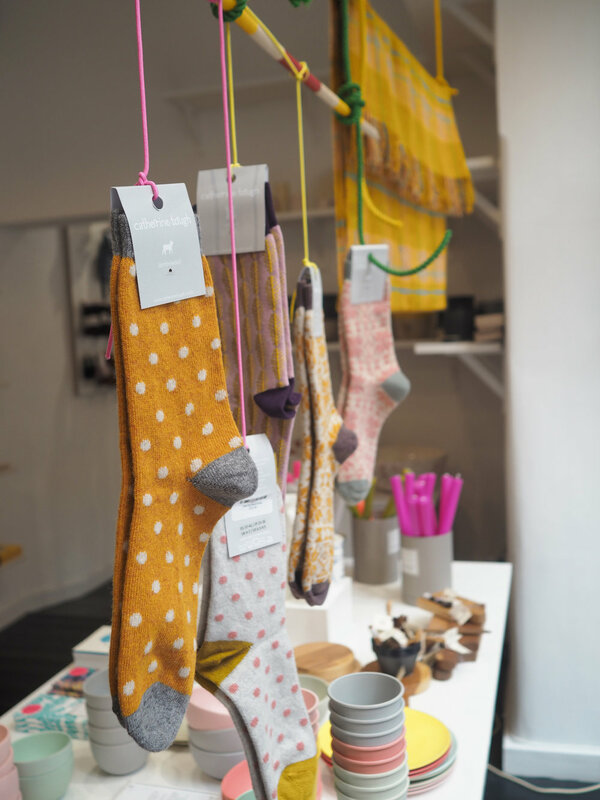 As well as stocking wares from independents, what do you create in-house? The independent shop thrives in East London and our neighbours and us were all competing for the same brands. We got a bit fed up with this and in 2016 as we celebrated ten years of Luna & Curious we pledged to return to our roots as designers and make many more products ourselves. Since then we have made our own scented candles, with their ceramic pots made in Stoke-on-Trent, candles in Wiltshire and boxes in Hull. Our range of Scottish-made women’s and kid’s knitwear is growing year on year. Plus we have launched our own womenswear, which, you guessed it... is all made in the UK. Next on the list is our own children’s clothing! You’re just about to launch your latest womenswear collection, which sounds very exciting… can you tell us more? 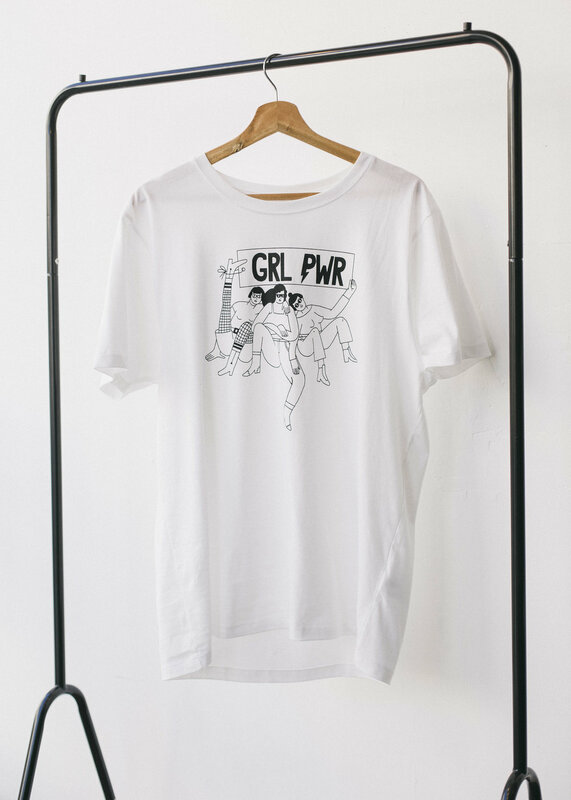 For our latest womenswear collection we have partnered with Making for Change Social Enterprise. This is a joint venture in garment manufacturing between London College of Fashion and HMP Downview, which provides training in fashion production skills and accredits participants with industry-recognised qualifications; offering a route away from re-offending whilst simultaneously addressing the skills shortage within the UK fashion manufacturing industry. The most sold product is a Hooray! card by Wrap. This is quite cheering, means there is plenty to say Hooray about! Our navy and orange spotted shirt dress went down a storm last year and we had to get more made fast. The Luna & Curious customer isn’t shy with their fashion, our candy pink rib knit is the bestselling women’s jumper. Which is your can't live without product? Polly: Our range of scented candles, it was really enjoyable to link up all the elements required to produce the items in the UK. 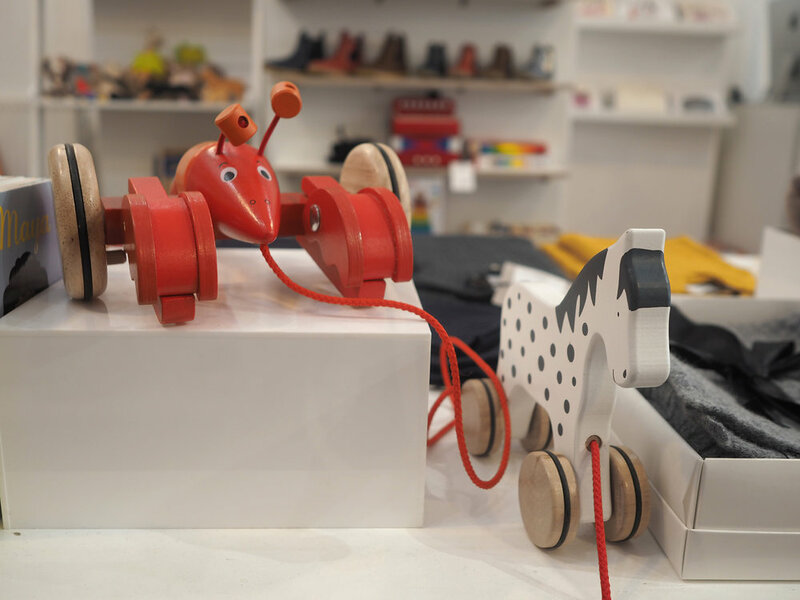 Rheanna: Holztiger wooden animals, my son’s collection is constantly growing (I say his! I mean mine). What do you enjoy most about running Luna & Curious? The people. We have fantastic women working at Luna & Curious which makes it everyday fun. Everyone works so hard, we are very fortunate. We eat well too! What has been your career highlight (so far)? Moving to Calvert Avenue in 2010. After two written proposals and a 90 minute interview, Tower Hamlets offered us the lease on these premises. In fact it was too big for us for a few years, but it offered us an exciting future with the ability to expand. In 2018, we officially ran out of space! You have some rather lovely neighbours too, is community important to you? Hugely. As a business based in the Boundary Estate, we believe we have an obligation to be part of the community, respecting the residents. This is echoed in many of the businesses on Calvert Avenue. 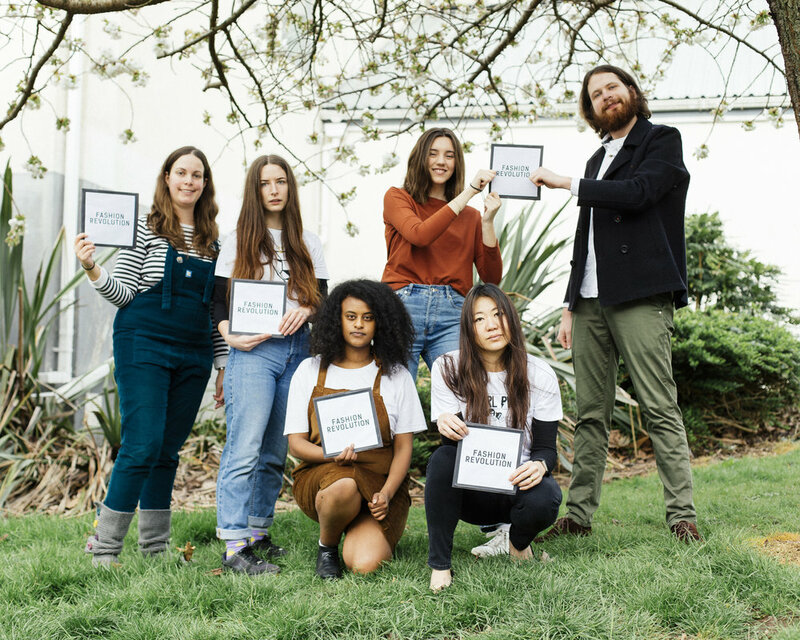 Luna & Curious is a founding member of the East End Trades Guild, a body that has come together to ensure a future for independent businesses in East London. The work done by the Guild in the face of rising rents and rates is fantastic. It’s really dull...but do your sums. Do a REALISTIC cash flow, make sure that six months down the line there is still money in the pot. Plus don’t try and do everything all at once. We’ve seen many businesses come and go over the years and the overriding reason is that the initial financial outlay on the shop fit and stock has been too much and eventually it drowns the business. 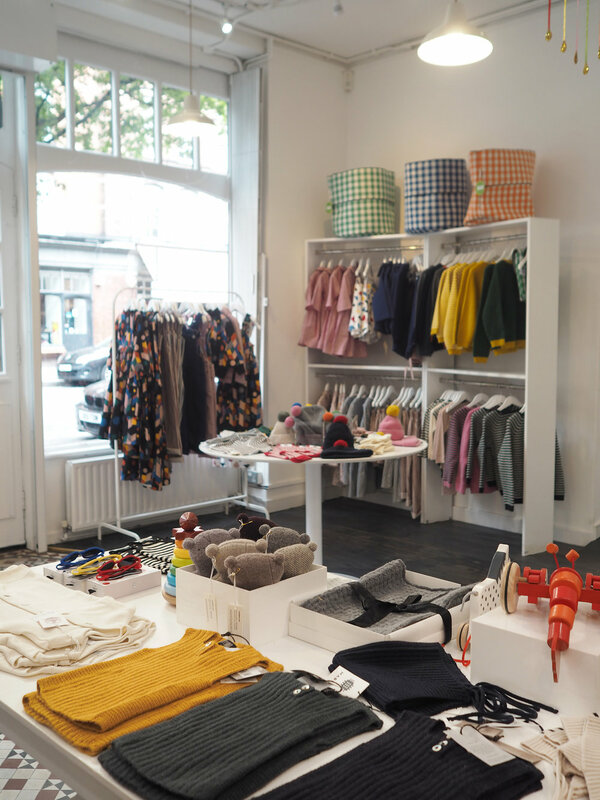 Find Luna & Curious at 24-26 Calvert Ave, London E2 7JP.